About Strouse | Strouse - More than Tape. Whether it’s 3M adhesive tape, PE foam, copper foil tapes or any tape product, we can convert material into usable parts for your process, project, or product. Pressure sensitive adhesive tape can be rotary die cut to solve applications in just about every industry. Die cut adhesive tape can be as simple as a roll of tape unwound and cut into the shape of a circle or as complicated as a multiple layers of adhesives and films stacked on-top of each other to create a medical device that is applied on a patient’s skin. Since 1986 Strouse has been designing and developing converted solutions using pressure sensitive adhesives for global manufacturers. We help companies design solutions that deliver converted adhesive material in the most effective and efficient manner possible. We save time and money by employing design and adhesive tape converting capabilities that produce components aimed to reduce your labor costs and improve performance of your products. This allows you to get products to market quickly while maintaining the highest quality. We operate the most sophisticated equipment in our industry to achieve superior product performance backed by a quality management system registered to ISO 9001:2008 standards. The presses we purchase are built customized both for our needs as well as the techniques we employ to convert pressure sensitive adhesive tape. We work closely with industry leaders like 3M, Tesa, Adhesive Research, Avery Dennison, MACTac, Berry Plastics, and other pressure sensitive adhesive and foam tape manufacturers. These partnerships allow us to provide you access to the best adhesives and flexible materials in the world. Combine this with our world-class adhesive converting capabilities and we design converted solutions for problems that you thought couldn’t be solved. 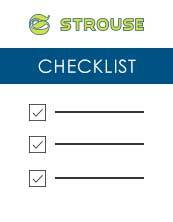 Strouse can die cut tape to custom lenths, widths, sizes, shapes, and formats. 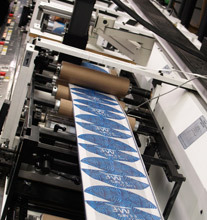 We can provide you products in the form of custom width rolls of tape or custom cut adhesive components on a roll of liner, on a sheet of film, or as individual pieces.